It is the most wonderful time of the year! 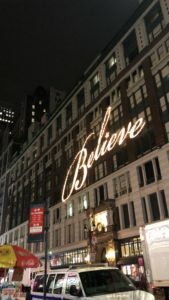 There are so many festive things to do this holiday season and NYC is one of the most magical settings. Between the illuminating decorations, special events, and warm drinks to cozy up next to a fire with, getting into the holiday spirit is as easy as homemade pecan pie. See some inspiration below for festive things to do this winter in NYC! Window shopping is one of our favorite leisure activities, especially when storefronts are decorated with festive illuminating lights and displays during the last few months of the year. We love strolling around the city streets in the evening to really see everything brightly shining. Accomplish two tasks at once and head over to Madison Avenue for some festive holiday shopping, which is home to Barneys, Hermès and other amazing destinations with great decorations. From there, you can easily make your way over to Fifth Avenue to take in the beautiful displays of Cartier, Tiffany’s and Saks Fifth Avenue. The only challenge is trying to leave empty-handed, but luckily many brands carry sales all season long to make holiday shopping a breeze. Many amazing pop-up shopping areas for the winter season and Bryant Park Winter Village is one of our favorites for when the Rockefeller Center tree is too crowded. Pick up a hot cocoa or delicious treat from The Lodge, which is home to dozens of NYC’s tastiest restaurants. The village offers great shopping from pop-up vendors, so be sure to wander through the winter wonderland and check everyone off of your shopping list. 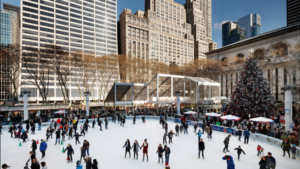 After strolling around the village, head over to the ice rink with your besties, which offers free admission and is much less crowded than Rockefeller Center. During the weeks leading up to the holidays, NYC’s streets are home to cold weather and delicious treats which pair perfectly together. You can’t go wrong when satisying a sweet tooth while in Manhattan, but we especially love popping in to bakeries like Milk Bar for fun and festive treats. After exploring the city (or even after a long day in the office), we love indulging seasonal sweets like the peppermint cookies and pumpkin pie cake truffles, which are made specially for the holidays. Don’t forget to snap an Instagram-worthy photo before you dive into the sugary sweet goodness! After a long day of exploring NYC, treat yourself to a festive drink in beautiful surroundings. 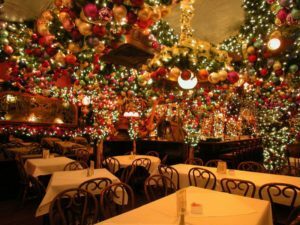 Some restaurants take their holiday happy hours to the next level like Rolf’s (281 Third Avenue), which is completely covered in festive garland and lights for the winter months. The holiday wonderland offers delicious egg nog, wine and other delicious drinks to enjoy. There are also many great holiday pop-up bars like the Miracle on Ninth Street (649 East Ninth Street, otherwise known as the East Village restaurant Mace during the other times of the year) which offers specialty cocktails, garland galore and even a ‘Hanukkah Hideaway’ in which guests can enjoy dreidels and festive decor. Be sure to check them out before they’re gone! There are so many festive things to do in New York to get into the holiday spirit. Try out some of our suggestions and end the year on the right note!